Where can you get a fast, cheap and great looking site design? Every day I see people in forums and on Twitter asking where they can get a fast, cheap and great looking site design. 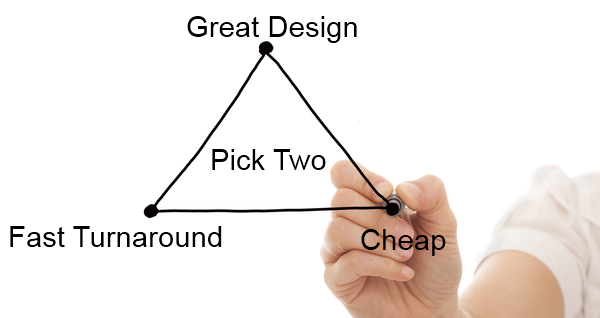 I propose that such a design tri-fecta doesn’t exist. You can get a great looking site designed within a fairly fast turn-around time, but you can also expect to pay a pretty good premium for it. No one’s going to drop all of their existing projects, to design a high level website for you at a discount. Period. You can get a simple site designed fairly quickly and at a nice discount, but don’t expect it to be fully customized. And remember, you get what you pay for. Yes, it’s possible to find a good designer who can knock out a nice looking site design for you, and at an affordable price. But don’t expect for it to get done quickly. They probably have other higher paying design clients who’s project takes priority over yours. Ultimately, you can’t have all three. I don’t know of any designer that will deliver their best work, at a fast turn-around time, and at a discount. (If I’m wrong, lucky you). You have to compromise on at least one. Pretty fair assessment, don’t you think? I couldn’t agree more. And the one you probably don’t want to sacrifice is Great Design too. Agreed, definitely don’t want to sacrifice on the design. It matters. Period. There is a saying we use, you can’t have great, fast, dirty and cheap!